A handy outlook express backup software utility designed to create backup copies of your email database ! 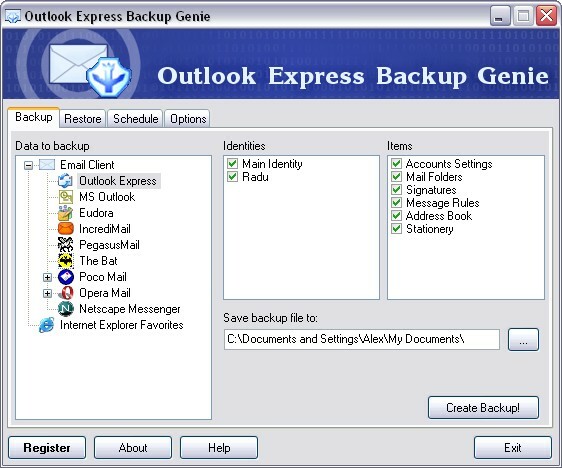 backup utilities Outlook Express Backup Genie works with the top 9 popular Email Clients such as MS Outlook, Outlook Express, Eudora, Netscape Messenger, IncrediMail and PocoMail. The Schedule feature allows you to backup the email database daily, weekly or at any chosen time period. 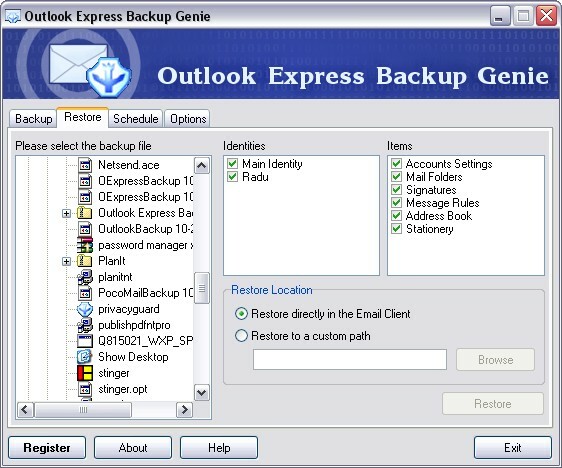 The email database can be saved on one computer and restored to another, thus making Outlook Express Backup Genie not just a backup utility but also a synchronization tool. The program is easy to use and has a simplified user interface, very useful for beginners. Easy-to-use interface, the user can choose the normal or the wizard mode! Transfer email data between different computers: fast and easy. Password-protected archives and automatic compression.